A great night indeed, as Lance said, with level 1 of Sage full, and Elkie giving about 150%. This lady can sing it all, ballads, rock, blues, soul, country, and I’m told that she also does a mean GASbook song, though there was no jazz in this gig. The voice is gutsy, bluesy, with long notes and much gospel style vibrato on some notes. She didn’t need backing singers as some clever electronic wizardry enabled Elkie to sing with herself, mostly as call and response, on some songs. She told us that she’d thoroughly enjoyed the evening and she meant it. She even apologised for the concert rescheduling, caused by throat problems. So we clapped along when encouraged by the drummer, and there was a standing ovation at the end of the evening. There was a touch of humour when an audience member shouted something which Elkie mistook as rude. She began to admonish the person diplomatically before a band member put her in the picture. ‘Get them up was what he’d shouted’ she was told. Talking of the band, they were well up to their game and had many short solos. The drummer related well to the crowd, the sax was quite jazzy, the guitars flowed well, and the keys came into their own especially during the encore with a moving love song, with just voice and keys. Elkie appreciatively introduced each musician during her well-known song Pearl’s A Singer, then promptly picked up a tambourine herself. 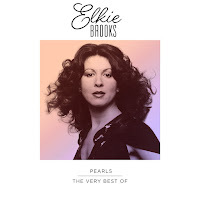 Some of the songs featured were from her latest CD, Elkie Brooks – Pearls – The Very Best Of. I didn’t get the names of all the songs, which were not announced, but included was Do Right Man(? ); Sunshine After The Rain; Fool If You Think It’s Over; To Make You Feel My Love; Gasoline Alley: Nights In White Satin; Lilac Wine; Love Ain’t Something You Can Get For Free; Don’t Cry Out Loud; No More The Fool; Pearl’s A Singer. The second half of the show was louder, bluesier, with lively flashing lights – then suddenly a black stage. The audience demanded an encore, which was the love song with keys only (A Song For You? ), then the whole band for Purple Rain; We’ve Got Tonight. Another very successful Sage gig, thanks to Ms Brooks and her band.